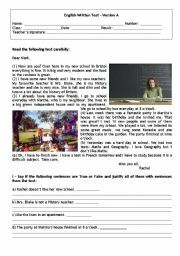 English test about school, using Simple Past and Simple Present. Also includes prepositions of place and simple past of regular and irregular verbs. This is a guide that you can hand out to students so they can pay attention to some details mentioned during the documentary. 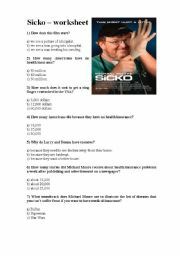 This is a written test I gave a couple of months ago. It also includes a listening exercise at the start. Transcript is presented at the end. Finding opposites, true or false questions, interpretation are also among the activities. Hope you find it useful! 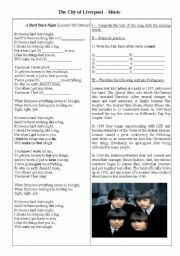 You can use this worksheet with two songs: It�s been a hard day�s night, by the Beatles and You�ll never walk alone by Gerry and the Pacemakers. Some translation exercises and weather related vocabulary are present.